The best sports grill in Wichita. Enjoy artisan pizzas, 23 big screen tvs, your favorite team and beer from 23 taps. At Deano’s Grill and Tapworks, our vision is to be famous by delighting one guest at a time. We offer original daily features and artisan oven pizzas. Watch your favorite sports team on one of our 23 big screen TVs. We offer the NBA network, MLB network, Fox Sports, the entire ESPN family, and more! 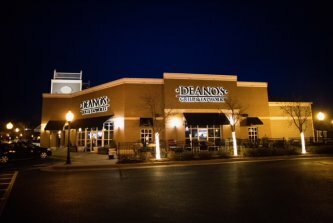 Deano’s sponsors watch parties for all local teams. All of our sports memorabilia are original hand-signed items from the biggest names in sports. Come enjoy your favorite team and drinks from 23 tap beers at Deano’s Grill and Tapworks! Just in time for the holidays, Deano’s Grill & Tapworks will have gift cards available for purchase in store.